Of all the outside influences on East Indies textile design, India, with its ancient textile traditions, was perhaps the most significant. 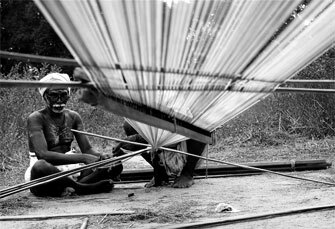 For centuries, Indian traders brought silk and cotton textiles to southeast Asia to sell and barter for spices, gold, minerals and wood. When European traders from Portugal, Spain, England and Holland discovered that Indian textiles were among the most coveted items of exchange for spices, their Indian rivals were edged aside. Thus, over a period of many centuries, large quantities of Indian textiles entered the region and some of the oldest have recently been carbon-dated to the 14th C. From within the royal courts of Java and Sumatra to the remotest villages on the islands east of Bali, Indian textiles were highly valued and became important symbols of prestige and status. Exceptional pieces were considered as 'pusaka', or heirlooms, and in certain parts of Indonesia are still venerated as such. Since Indian textiles were only accessible to the rich and powerful, eventually textile artisans from the East Indies region began creating their own fabrics employing many of the techniques and aesthtics found in their Indian counterparts. Once the practice of producing textiles became commonplace, unique, regional variations gradually emerged and new traditions were born. Nevertheless, many early Indian influences have been retained over the years and are easily identified in even the most contemporary pieces.